Our dear brother Norman Crawford passed into the presence of his Lord on August 16, 2017. He and Lois were married and living in Lansing, Michigan and in full-time service for the Lord when I came from Northern Ireland in November 1954. Over the years, we developed a lasting friendship, and I count it an honor to share some thoughts about him. In the mid 1950s, we met Norman’s mother at Waubaushene, Ontario and she asked my wife and I over for tea and Irish soda scones (they were good!). She told us about Norman, and it was obvious she loved him very much and prayed for him continually. He was a joy to her. Time went on and he had numerous meetings in our assembly (Pape Avenue Gospel Hall, Toronto) with a variety of the Lord’s servants over the succeeding decades. He was an excellent conference speaker, expounding the Word in ministry softly and effectively, and preaching the gospel with God’s evident presence and power. He was rarely, if ever, absent from the Toronto Easter Conference until his health in latter years prevented his attendance. With his gracious and articulate manner, he could speak to, and debate with, university professors and students, acceptably representing his faith. Norman and Harold Paisley teamed together on several occasions for the United Gospel Campaign in Seneca College and later in the Stephen Leacock Collegiate. Despite the fact that Harold lived not too far away, he often stayed with us, so that he and Norman could have the opportunity of being together, discussing the Scriptures, and looking to the Lord for help for the meeting each night. Their interest was both deep and touching. They had a real respect for each other. Many started their faith in Christ as a result of these campaigns. As editor of Truth & Tidings magazine from late 1977 until December 1996, he carried out his duties with grace and love mixed with business acumen, while furthering the exposition of the Word. In the home, Norman was always polite, always the Christ-like gentleman, and was loved and highly respected by everyone. One thing that stands out in my mind regarding him was his deep love for Lois, his wife. She was his helpmeet provided by God for him. He cherished that thought and, as for Lois, she reverenced her husband. They were a Godly couple to be emulated. He also had a lot of respect and love for Lois’ parents, Mr. and Mrs. Lorne McBain. Mr. McBain took him under his wing as a young man and mentored him in the faith. Our beloved brother Norman Crawford was respected and appreciated by all who knew him. Many of those believers who knew him best are now with him in Glory. He never forgot the place where he was born, grew up, was saved, and in his late teens, was commended to the work of the Lord. The writer’s first meeting with Norman was at a conference in Sarnia, Ontario in June 1960. His genuine interest in a young couple continued from that day. We had the great privilege of hosting him many times in our home. He was always a courteous Christian gentleman, whether in the home or gathered with the believers in the Toronto assemblies. Our brother was highly respected by all. He had many gospel meetings in Toronto. In the 1980s, along with his good friend and fellow laborer, Harold Paisley, he preached in repeated series of meetings at Seneca College and many souls heard the glorious gospel. The last gospel meetings at which they both preached together were in Langstaff in March 1998. God was honored and souls were saved. There was much joy, and the assembly was encouraged. While our brother lived and labored in different areas, we do not forget his labors during all the years of the Toronto Easter Conference and the Mimico Bible Readings. He was always considerate of his fellow workers. What an example to follow until the Lord comes. “And she said unto her husband, Behold now, I perceive that this is an holy man of God, which passeth by us continually” (2Kings 4:9). 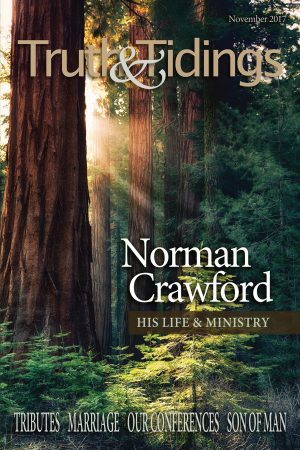 No one who knew Mr. Norman Crawford would doubt for a moment that a holy man of God crossed their path. As an editor, scholar, writer, preacher, teacher, servant, shepherd, counselor, minister, and friend, his influence was indeed profound. His impact on untold lives, numerous assemblies, and the work of God throughout the world is hard to measure. The Poet Carl Sandburg is credited with saying: “A tree is best measured when it is down – and so it is with people.” Because of his continued influence, measuring the full impact of his life is not easy. In some ways, due to his weakening condition, we have had to learn to do without his steadying hand for a number of years. And we are all the weaker because of it. My experience with Mr. Crawford was not as extensive as that of others, but listening to his gospel preaching left me convinced I was listening to someone who knew how to bring the light of gospel truth to darkened minds and hearts. A perfect gentleman on and off the platform, he was able, without harshness, to warn sinners of their danger; tell them, without anger, of their sinfulness; and lead many of them, with great wisdom, to the Lord Jesus. His various gospel series throughout the world were richly blessed by God. When he and Mr. Harold Paisley teamed up for the Seneca gospel series in Toronto, they saw numerous souls reached, many of whom are still in fellowship today. His gospel meetings in Bryn Mawr, PA, in 1969, with Mr. Sidney Maxwell are considered by many who were there to be the best series ever held in this area. His erudition and eye for detail made him the obvious choice to be editor of Truth & Tidings, a position he filled skillfully and conscientiously for a number of years. And his book, Gathered to His Name, became de rigueur reading for young converts interested in assembly fellowship. He led by example, and without sitting down with young preachers and giving verbal instructions, he was able to influence a generation of men who were trying to learn how best to present the gospel of the grace of God. The Shunammite woman who recognized Elisha as a man of God could scarcely have foreseen the deep debt she would eventually owe that man. Many believers, many preachers, many sinners, and many assemblies owe a deep debt to Mr. Crawford for his wisdom, guidance, example, and help. And this causes gratitude to God for His having saved a young boy in Toronto so many years ago, equipping him for the work, and then calling him into His service. There was never a doubt as to our brother Norman Crawford’s gift and ability. From his early years as a believer, it was evident the Lord had called him to serve Him. Saved as a young person, he soon took an interest in gospel work. Older servants of the Lord expressed confidence in him, encouraging him in the spread of the gospel. Commended to full time service at the age of 18, he was not averse to working in new areas. One of his early mentors was Mr. Lorne McBain, who was a great help to him as they labored together in many gospel series. When attending conferences in those early days, our brother would often have the responsibility to speak to the Sunday school. During the 1950s, Brother Crawford labored in a new field of labor –Clyde, Ohio. One of the earliest contacts there were Mr. and Mrs. Harry Hyde, who had relatives in fellowship in Iowa. The work was slow at first, but the Lord opened doors and souls were saved, followed by a number of baptisms. Our brother knew God and His ways, spending time in prayer and in The Book. Years later he would write a most helpful book, Gathering unto His Name, which has been a blessing to many. This book reflects his experiences and the truth of God he loved and appreciated. The years spent in the Clyde area were also a time of blessing for the surrounding assemblies, as we enjoyed helpful visits by our brother. His ministry was Christ-centered, practical, and positive. He was always relevant. He was an excellent teacher among us, both in written ministry and public speaking. For many years he edited the Truth & Tidings magazine and his teaching was rich, helpful, encouraging, and Christ-centered. Our brother was highly esteemed in North America and the UK, preaching in countless gospel series and ministry meetings for the saints of God. He truly lived his life for others, often traveling many miles to help a struggling saint or sinner. His teaching transcended his generation and has been a blessing to many younger saints. Brother Crawford’s counsel was most helpful. His years of experience, understanding of Scripture, and gracious spirit were used for the glory of God and for the blessing of God’s people. With his homecall to glory, we are all the poorer. He will be remembered for his love for precious souls, for the people of God, for his dear wife, Lois, who was a genuine helpmeet in the Lord’s work, and for his son Rodney, and family, who await the blessed hope. It was a beautiful October day when he approached me and asked if we could talk. As we sat together, he very directly said, “I would like you to take over being editor of Truth & Tidings!” Looking back, that single incident seems to epitomize the man. One of the many great accomplishments of his life, the magazine, was graciously being handed over to a younger man. There was no hint of condescension. He did what few men have the grace to do – he ceded responsibility to a younger man who was not his equal in any measure, and he did it with the same grace and dignity which marked all he did. It was obvious that the magazine was not about Norman Crawford, but about the welfare of the people of God. Norman Crawford was a household name to a previous generation on both sides of the Atlantic. His voice has been silent now for almost a decade due to the extensive care of his wife in her illness and to his declining health. A man of character, he was respected by all, not because of a position he occupied, but because of a character he manifested. Christ-like and selfless, he moved with singular focus on the glory of the Savior He loved, and with a heart burdened for the welfare of the people of God. His labors in the gospel took him across the continent. He saw the assembly planted in Clyde, Ohio, and was instrumental in the formation of perhaps five others. He loved the gospel, and preached it with warmth and power. Many are those who will rise up and thank God for sending him to them with the gospel message. He ministered extensively and to great profit at conferences and in local assemblies. His careful exposition and practical application of Scripture proved a great benefit to all. From his pen came The Gospel of Luke in the WTBT series; and his book, Gathering to His Name. In my opinion, both books are among the best ever written on the subjects. For almost 20 years, he edited and contributed to Truth & Tidings, raising the level of its usefulness for those many years. As was said so eloquently of King David, “He served his own generation by the will of God, (and) fell on sleep” (Acts 13:36, KJV). No more fitting epitaph could be written for him.